Edited Eating is not a nutrition blog. It’s also not a fitness blog. It’s a blog about what I did to improve my health by changing my diet, and the things I’ve done to get fit and have fun at the same time. When I started my journey in January 2017, I tipped the scales at 107.4kg. Unhealthy, uncomfortable and terribly unfit, I decided to get in shape by changing my diet and getting active. As a newspaper editor who often works 12-hour days behind a desk with little physical activity in-between, I had to make drastic changes, not only to my lifestyle, but also to how I thought about food and movement. And so, I decided to take the same approach to my diet and lifestyle that I did to the stories I worked on. When you sub-edit a news report, you choose the best words to tell the story, cutting out the badly written parts and details that do nothing but add extra weight. With this strategy in mind, I decided to edit my eating, re-craft my story, and cut down on whatever was not going to result in a happy ending. What worked for me was the Paleo diet – which meant cutting out all grains, sugar, dairy and legumes – and focusing on eating whole, nutritious foods. 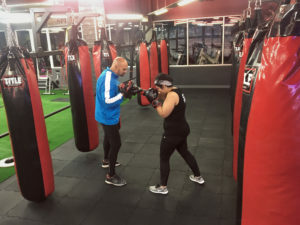 Within a year, I had lost 33kg of weight and as my journey continues, I’m gaining a tremendous amount of experience, knowledge and insight, which I will share on this blog.